Sharp's vertical in-folding phone patents have now been translated into a working prototype, and the company just demonstrated the concept which resembles a foldable clamshell of sorts and works like a charm. In fact, Sharp's approach is closer to what we imagined a foldable handset would be - an old-fashioned flip phone that has an uninterrupted screen where the hinge would be, making it compact to carry, and giving you a huge display when you need it. 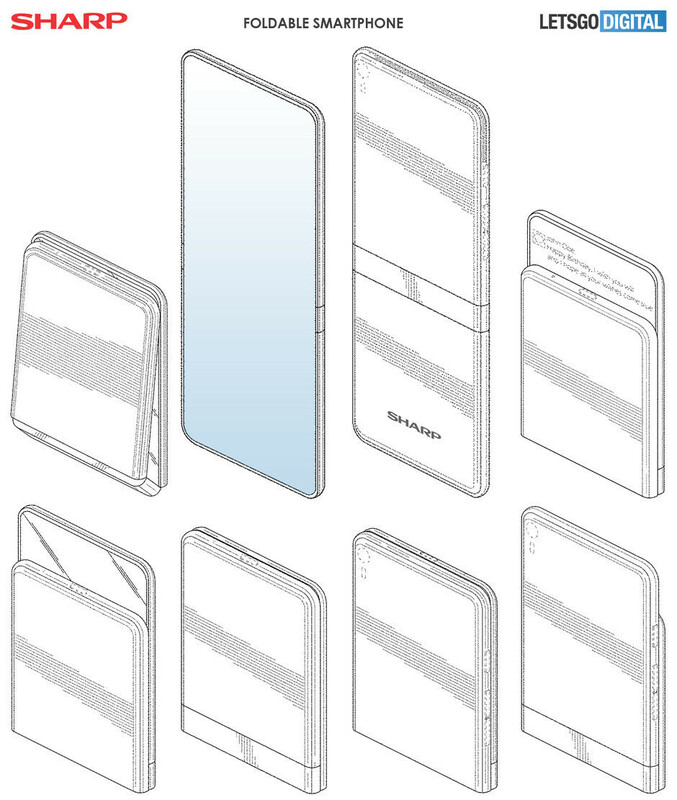 The Galaxy Fold and Mate X are chasing a different concept, and are rather bulky when folded in addition to impractical when unfurled. Watching YouTube on the unfurled display, for instance, renders a huge chunk of their large displays unutilized which defeats the purpose of lugging a bulky and expensive foldable phone with you. Now, the only thing left is to hear the specs of the Sharp's folding phone prototype and whether the company aims to license or materialize it in some form. The 6.2" OLED screen is certainly ready and can be folded 300,000 times before it creases, says Sharp. The more foldable form factors, the merrier. Is Sharp's 'flip phone' foldable a better concept than the Galaxy Fold or Mate X? Yeah looks great, this is the foldable device we want. Samsung has already this fold in plans. Yup. Samsung had this plan from over 5 years ago. Just google Samsung foldable concept. It's wasn't Motorola, it wasn't Sharp. Those concepts you mention were created by graphic artists based on patents that Samsung had. Samsung never actually revealed a clamshell flexible display phone to my knowledge. Now it may be true that Samsung first patented a clamshell flexible phone like you claim, but I can’t find any research on Sharp patents to verify. Samsung’s patent on a clamshell folding phone was filed in April 2016. Looks LG same foldable in 2015. This is like a really portable phone, Samsung has something between weird phone and a tablet and huawei has a foldable tablet. I don't know which one I prefer. I'd have to use all of those to make my mind. You forgot to add the option, "Folding phones are an idiotic idea in general." I just wait for apple to release one. And for sure, it will be phenomenal and these half baked foldable phones will be forgotten. You will be waiting a very long time. C'mon, dude, Apple also makes s**tty products. These are important steps in the evolution of the smartphone, but I'm hoping the flexible display will lead to something that expands more like the "global" from Earth:Final Conflict. Sharp always has been so innovative don’t know why they haven’t become more mainstream relevant.